DC Comics's World War III, the mini-series taking place before Week 50 in 52, makes unquestionably for a somewhat awkward collection. While I understand's DC's decision not to put World War III in the fourth 52 collection and break up the story's flow, it's hard to believe anyone but 52 readers are going to buy the World War III trade. JSA and Black Adam fans will find much to enjoy here, though they too are probably already reading 52; however, longtime Martian Manhunter fans should take note, as World War III works to bridge the changes between the old and new J'onn; the Manhunter functions here in a framing copacity that I found completely congruous with J'onn's general portrayal. Ultimately, the goal of World War III was to bridge the 52-One Year Later gap where the 52 series itself failed. Any of a number of series get the assist here, from the JSA to Checkmate and the Teen Titans, the Doom Patrol, Supergirl, Firestorm, the Spectre and more. For the most part I found these assists somewhat unnecessary--the Batgirl/Deathstroke meeting hardly explains more about Cassandra's change, nor is Donna Troy wearing Wonder Woman's armor explained; Jason Todd taking on Nightwing's persona was explained in that title, and hardly needed repetition here. Others, like the scene with the Kate Spencer Manhunter and with Checkmate/the Suicide Squad, were so tied to plotlines in those respective titles as to make them inscruitable. As a 52 fan, I'd say that I did enjoy World War III. The sheer scope of the destruction shown, and the number of heroes that appear, makes a nice counterpoint to the splash page at the end of Infinite Crisis, showing all the heroes who will fill in for Superman, Batman, and Wonder Woman. 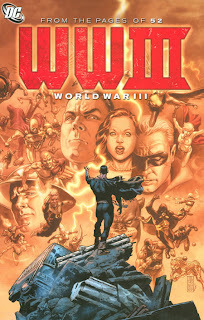 But while World War III is a good Martian Manhunter story, if nothing else, I hardly felt like it was integral to the 52 story; if DC has decided simply not to publish World War III, I hardly think we would have missed it. For the 52 completists, go ahead; for others, consider borrowing this one from the library instead. Our review of 52, Volume Four coming Thursday!